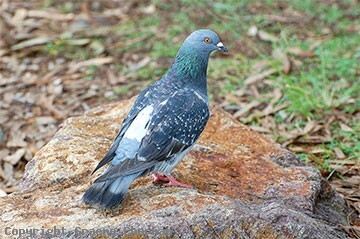 The Rock Dove or Feral Pigeon hardly needs any introduction. 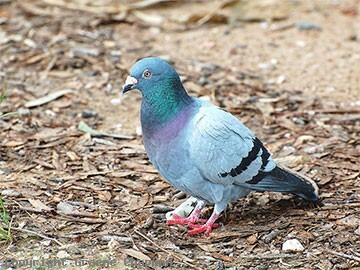 Rock Doves occur all over Australia, primarily in association with human settlement but they have expanded out into the wild and breed in such places as sea cliffs and tree hollows. In cities and large towns where there are multi-storey buildings and lots of ledges, they are regarded as a pest, primarily because their concentrated droppings and nesting material deface buildings, block drains and downpipes and involve considerable expense. In these areas instead of grain, they have adapted to eating rubbish, bread and the like, often offered by well-meaning humans. 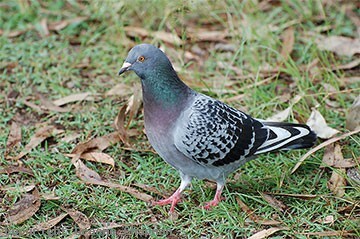 Domestic breeding has resulted in a very wide range of colours and patterns. 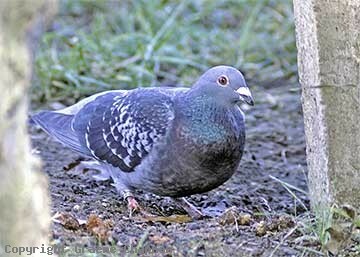 The bird in pic #957202 is perhaps closer in looks to the ancestral rock pigeon which is widespread in the Northern Hemisphere.